So, who listens to more radio: Boomers, Gen X, or Gen Y, also known as millennials? Why do millennials spend so much time listening to radio? According to the latest research, they say radio ‘energizes’ them, or improves their mood. They may feel lonely and just want the comfort of a familiar voice to entertain them. They say they’d be more disappointed if their favourite station went away than if Facebook disappeared. They value justice, integrity, family, practicality and duty. 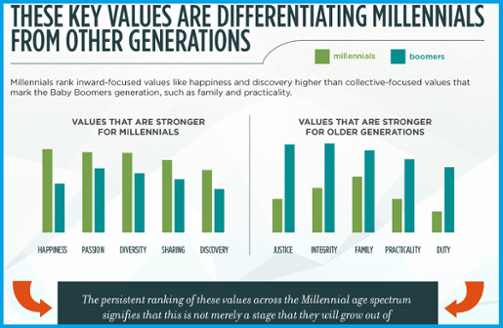 On the other hand, Millennials value happiness, passion, diversity, sharing and discovery. Understanding this fundamental difference in values is key when creating commercials aimed at Generation Y, because your spots should speak to these values. Here’s an interesting chart that lays it out graphically. Connect with the station’s listeners – get to know the fan clubs, opt-in databases, facebook friends and twitter followers. The station can help you get involved. Make ‘friends’ – most listeners feel like the station personalities are their ‘friends’. They then connect on social media, and listen to them consistently on air. They feel like they know them and trust them. Go off air: create an event of your own outside of radio, then promote it on air: for example, a jewelry store could team up with the station for a Valentine’s Day promo – the DJ asks listeners for song suggestions, then posts them online (on Facebook, Twitter, the station’s website, and so on) where listeners can see the list, then their friends are encouraged to vote for their favourite songs and the list grows… the winners are then played throughout the evening of Valentine’s Day, and the sponsor wins bigtime! Create a catchy tagline or jingle: if it’s good, both listeners and announcers may parody it or at least repeat it. Try to use one small phrase (or as Roy Williams calls it a “brandable chunk”) that encapsulates the emotion of your offering and is easily remembered and shared, like the phrase from the Cash For Life Lottery, “FAN-tastic”, or like the McDonald’s jingle, “I’m Lovin’ It”. Avoid producing a radio spot that sounds like a radio spot. Millennials hate to be ‘sold’. They don’t like loud, hard-sell, in-your-face, old-school radio ads… they prefer subtle. Gen Y loves to ‘discover’… so don’t give them any info they can find for themselves in :10 seconds or less. Millennials love to search Google for answers. Use the right voice: avoid Voice-of-God radio announcers & hyper DJs; use real millennials to voice your spots. Make it personal: they want your message to be customized and relevant to their lifestyle. Make it credible: your message should be believable and real… millennials hate typical advertising hype that seems irrelevant to their lives. Context and credibility matter more than the message. Millennials want to be entertained by radio spots that speak their language and are relevant to their particular set of values. They listen to more radio than any other generation, so if you want them to like your brand, make sure your creative speaks their language.